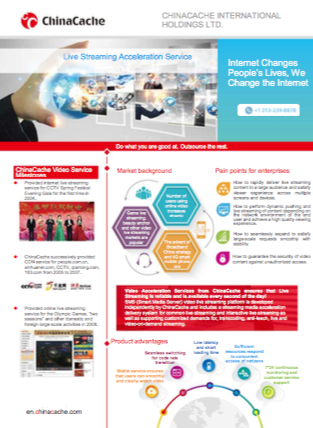 ChinaCache’s Live Streaming Acceleration Service solutions accelerate and optimize the performance of live and video-on-demand (VOD) streaming into China. Today’s online users expect instant gratification when it comes to playing videos on their multiple devices. However, delivering smooth and high-quality video streaming into and out of China is particularly difficult due to challenges associated with securing large capacity for limited use, establishing reliable international connectivity and ensuring that regulatory compliance is met. ChinaCache’s “built-for-China” video streaming solutions are specifically designed to overcome these challenges through private line infrastructure, massive scale and coverage, and regulatory guidance.